Material and Finish: White powder-coated stainless steel posts with teak wood top rail. 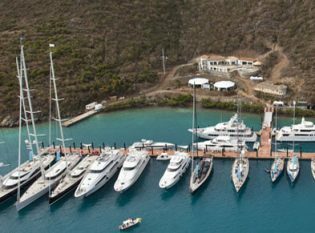 Yacht Club Costa Smeralda, the premiere sailing association based in Italy, opened a clubhouse and marina in Virgin Gorda, one of the British Virgin Islands. The oceanfront clubhouse overlooks the tranquil waters of the North Sound and has direct access to the 38-berth marina. 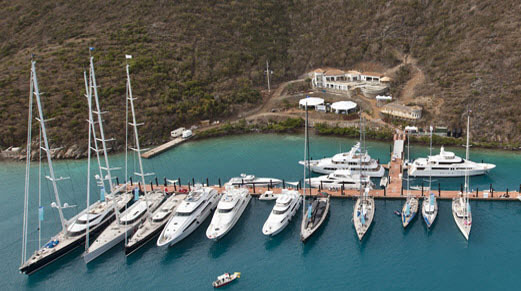 At their Caribbean location, the YCCS hosts international regattas. The project manager at Victor International found Keuka Studios online and was impressed by our ability to adapt our designs to the unique needs of our clients. The designers decided on our Ithaca Style cable railing because of its simple, unobtrusive design. 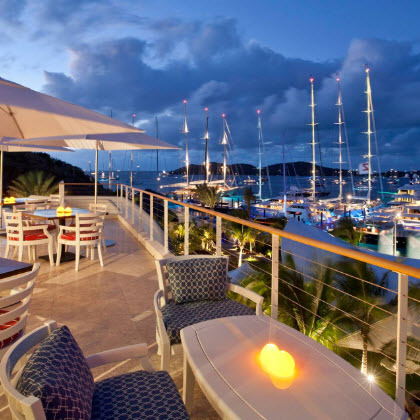 They selected white powder-coated stainless steel posts and a teak wood top rail. This combination of materials can resist corrosion even in a harsh saltwater environment and also blends in perfectly with the clubhouse’s nautical design. For a clean and polished look, the railings posts were core drilled into the clubhouse’s concrete structure and tile was fit around them. Each post has a custom CNC machined escutcheon plate. We also had to come up with a creative solution for the termination of the railing system; our engineers designed a terminal anchor inspired by a headboard plate. 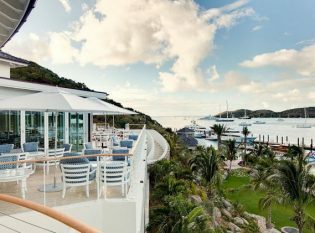 The railing surrounds the terrace and dining areas of the clubhouse allowing for a stunning view of the ocean, sailing vessels, and distant islands. 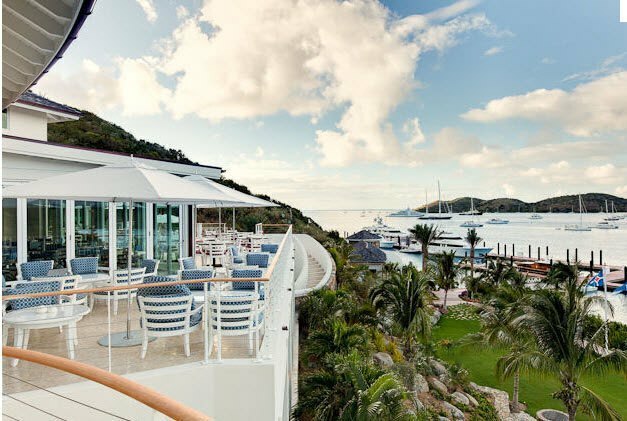 Keuka Studios custom cable railings created for YCCS in the British Virgin Islands. 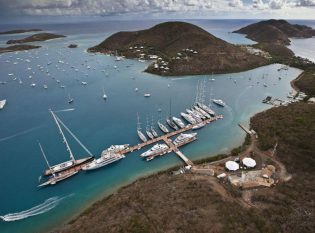 Aerial view of YCCS Marina. 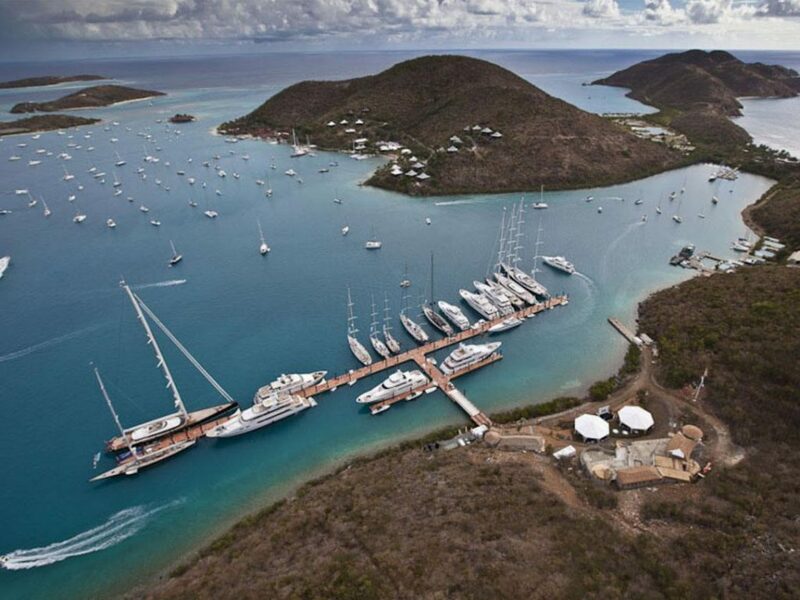 YCCS yachts in the British Virgin Islands. 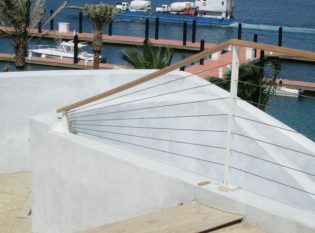 Specially designed railing parts for any unique situation. Patio view through the powder coated stainless railing.